The human body is an extremely intricate piece of machinery. In order for it to function properly, it needs to keep chemical levels at a near-perfect balance. This is called homeostasis and is a critical aspect of all living organisms. If pH levels get too low, acidosis can occur. Mild acidosis can result in fatigue, nausea, and vomiting, while more severe cases can cause headaches, drowsiness and if left untreated, it can cause stupor, coma, and can be fatal. The alkaline diet is also known as acid-alkaline diet or ash diet. The body’s metabolism burns foods that leaves ash that can be acid or alkaline – which is the pH state. The acidic ash is harmful to the body and can make you vulnerable to infections. The alkaline is beneficial as it protects the body. When an environment is acidic for a long time, the normal cell structures and functions are damaged. This can allow the harmful microorganism to attack the weakened cells. The only exception to this is the stomach. It is in that state of acidic in order to properly break down and digest the foods that we eat. The body can become acidic through lifestyle choices like an unbalanced diet. The good news is that, if this is happening to you, there are steps you can take to fix it. 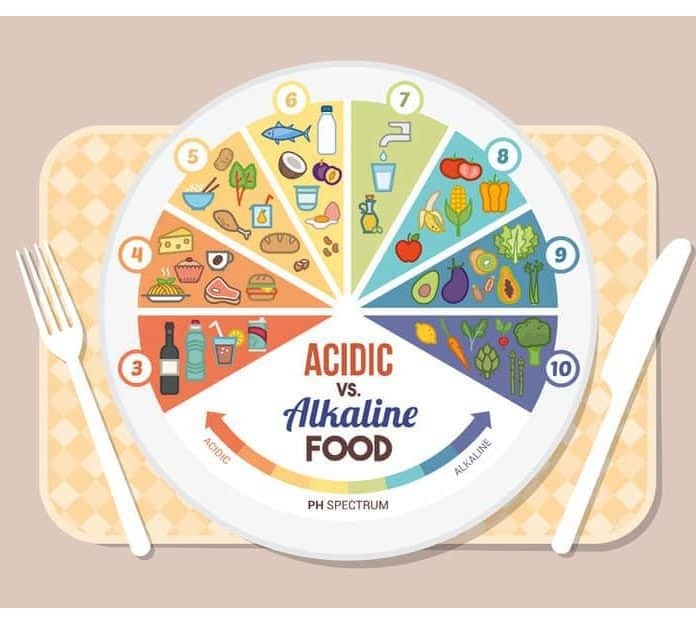 There are natural alkaline foods that will reverse the acidic levels in the body and leave the body healthy. Here are 10 alkalizing foods that can improve your health. Lemons are a citrus fruit, and even though you may think this would make them purely acidic, they are actually both acidic and alkalizing. Outside of the body, lemon juice has a pH level below 7. This makes it acidic. However, when lemon juice has been fully metabolized inside the body, it raises the pH levels above 7, which has an alkalizing effect. Fresh lemon juice has antibiotic, anti-inflammatory, and antioxidant properties. It’s high in vitamin C and contains vitamins E and B6, as well as lots of folate, potassium, thiamin and pantothenic acid. And as it contains zero sodium and fats, it’s a perfect addition to your diet. Lemon juice not only raises the alkaline levels in your body, it also helps decrease cholesterol, reduce congestion, boosts immunity, increases metabolism, fights aging signs, supports a healthy colon and digestive system, and helps flush out all the toxins that can build up in our body. Every morning, squeeze half a lemon into a tall glass of warm water and drink on an empty stomach. Not only is it a great way to break the overnight fast and kick-start your metabolism, it also replenishes water and naturally flushes out the toxins that can build up while we sleep. Making this a daily ritual will result in clearer, healthier skin, more energy and an overall feeling of wellness. If you suffer from strong acid reflux or mouth ulcers, lemon juice may cause irritation or burning sensations and as such, it’s recommended, to begin with a smaller amount of lemon juice, slowly increasing how much you drink.